Finding the Best WordPress Hosting 2019 has never been easier. Thanks to hundreds of hosting companies and thousands of affiliate marketers its getting really hard to choose the reliable WordPress hosting for our business. I bought an domain and hosting account from top web hosting companies. I installed default WordPress and did some basic optimizations. Then, I started monitoring the uptime and response time (24x7) and sometimes talk with customer support. I collected the data for the past 12 months and listed the WordPress hosting companies based on its performance. Hostingstep is really proud to show you the transparent web hosting reports, thus helps you in choosing the best WordPress companies. SiteGround clearly steals the show as the best overall WordPress Hosting. Our data shows why they deserve the #1 position ahead of other companies. Even a 1sec delay causes 20% decrease in conversions and you can understand how vital the uptime for online business. I started monitoring the uptime of my demo sites hosted on SiteGround servers for the past 12 months and the results are impressive. I got the promised 99.99% Uptime and its the only hosting company to achieve so. Respone time is so important as uptime. 40% visitors never visit a website which loads slower and if you do SEO, you can see Google gives ranking improvements for fast loading sites. So its mandatory to have a fastest WordPress hosting for your sites. Let see how much our SiteGround demo site scored month wise. Can you see the consistent performance of the SiteGround every month ( Sep 2016 -July 2017). On an average the sites loads in 344.82ms which is highly impressive considering the fact few renowned web hosting companies takes 2000ms on an average load time. You got an awesome uptime and response time, what else do you expect from a hosting company! Support right? 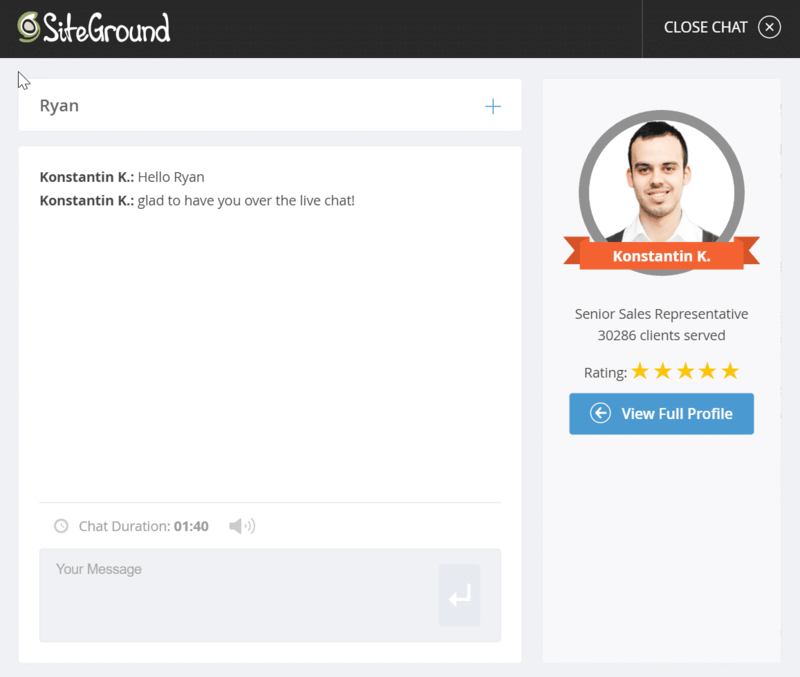 SiteGround truly offers an 24/7/365 customer support through chat, tickets and Phone. Thanks to customer focused motto, SiteGround offers everything to satisfy the customers. The customer support goes through an 8 week intensive training program before placing into a team. One click installation and one click staging. Complete SSD Hosting with 24/7 customer support. Free WordPress site migration from your previous host and your link to get started! A2 Hosting is all about speed. I was impressed with the response time loading around 172ms on an average of ten months. A2 Hosting also comes with impressive uptime and customer support. Wondering how A2 Hosting such an impressive response time? Thanks to A2 Optimized WordPress installation which gives such an results! A2 Hosting comes with 24x7 US based customer support. All the support folks are knowledgeable and gives out solid solutions for critical queries. Offers Fastest WordPress at a price lesser than Starbucks. If you love saving money more than anything yet need a performance based WordPress hosting, FastComet is the hosting for you. 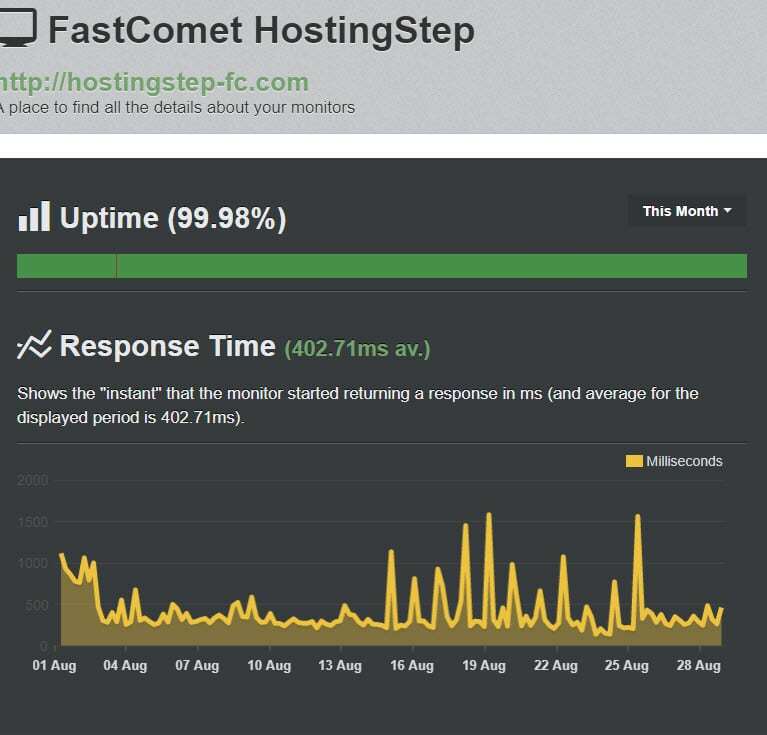 Why I say FastComet as the budget hosting? Because it comes with same renewal price. While most hosting companies charges 2X on renewals, currently FastComet is the only company to come up with flat renewal price. The uptime of every month will be similar to this cloaking around 400ms. Thanks to SSD drives, five layer caching mechanism and reliable datacenters, FastComet comes with pretty good response time. 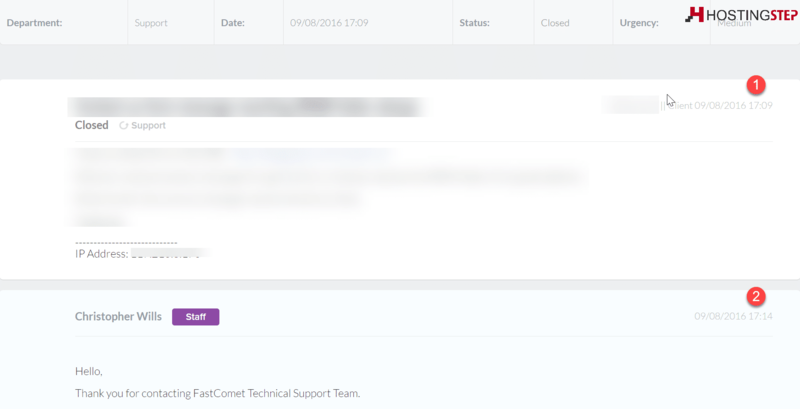 There is a good thing and bad thing about FastComet customer support. The bad thing, the live chat support is only for queries and other stuffs. You need to raise a ticket to solve the tech issues. The good thing, since FastComet 100% rely on tickets, you will get a response in less than 10 minutes. This is one of the recent tickets I raised asking for site optimizations and I got a reply in 5 minutes. BitNinja powered secure servers, SpamExperts powered Email hosting and all the above comes with an low price of $2.95/month and your exclusive link to get started! TMDHosting was founded in 2007 but still unknown to most people. They are one of the first few companies to come up with latest innovations like SSD drives, Free SSL, latest PHP support from 2013 onwards. The servers are pretty solid with seven datacenter locations across the globe. Let's see the reports. Your website will be hosted in a closet location to your websites visitors. So the latency rate is low which paves the way for very minimal downtime's as you can see most months comes with 100% uptime. 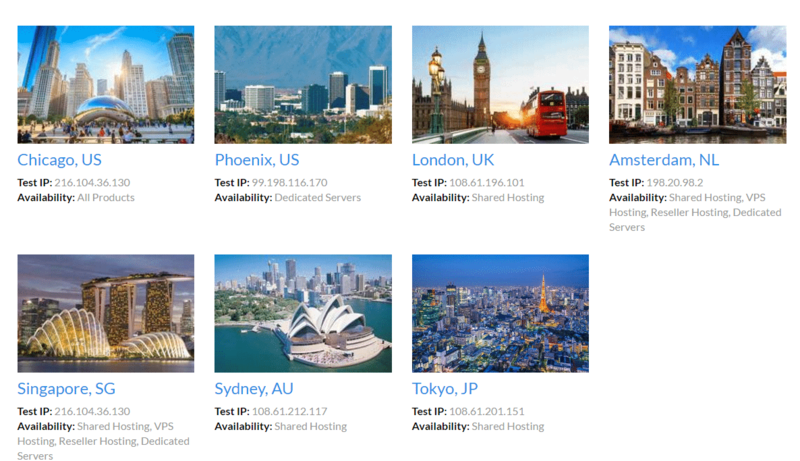 Can you check the loading time of our demo sites on TMDHosting from worldwide locations? It's pretty impressive faster compared with most hosting companies. Like FastComet, there is a good thing and bad thing about TMDHosting customer support. The bad thing, the live chat support is only for queries and other stuffs. You need to raise a ticket to solve the tech issues while there average response time is 9 minutes. All SSD based servers for fast loading websites. The company partnered with several other tools like Jetbackup to give solid hosting experience just with a price tag of $2.85/month (The cheapest hosting recommendation from Hostingstep) and your link to get started! InMotion Hosting the leader is web hosting business offers managed WordPress hosting solution for serious business. 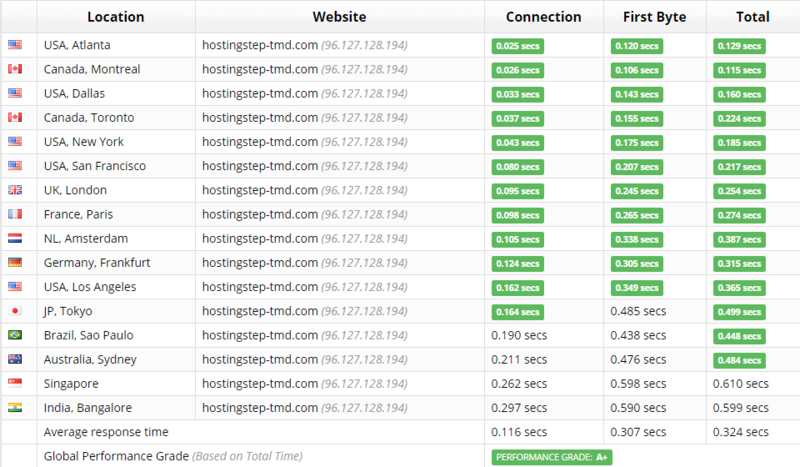 Let's have a look into the performance of our demo sites hosted on InMotion servers. We stopped tracking InMotion Hosting since Aug 2017 since the loading time is not good. However, the company now started offering optimum cache, Free SSL and SSDs. So we are hoping to test them again. InMotion hosting offers better support through live chat and tickets. They have a well established team. Your search for best WordPress Hosting 2019 ends here with Hostingstep. 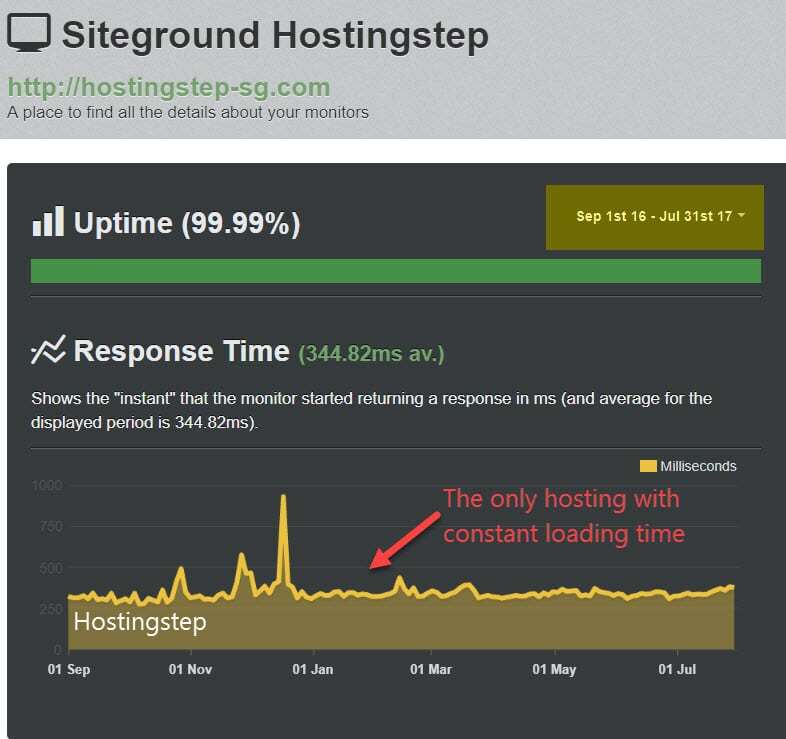 If you checked our data based approach, you can see SiteGround comes with consistent uptime & response time and I recommend them as the best WordPress Hositng. However, if you're looking for Fastest WordPress Hosting, you can check A2 Hosting.